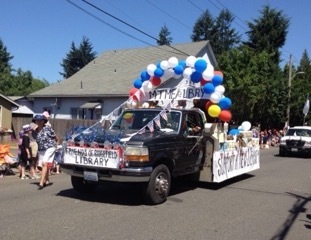 Ridgefield celebrated Independence Day in style. We know how to fancy up a truck, don’t we? We’re pretty serious about our FUNdraising around here! 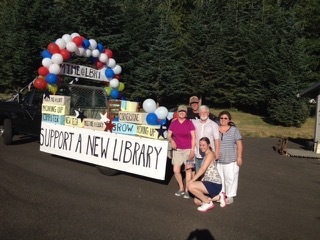 This entry was posted in Building a New Library, Community Action, Fundraising, Libraries are a Treasure, Non-Profit, Supporting libraries, Volunteerism and tagged decorating a float, Independence Day, parade, Ridgefield City Event. Bookmark the permalink.